No matter what your style, body type, age, or budget is, there are three factors that always apply as you choose your wardrobe. Fashion expert Tim Gunn labeled them as silhouette, proportion, and fit. Follow these universal guidelines to lay the foundation of a wardrobe that will make you always look your best. Silhouette refers to the shape or outline of an article of clothing. It should match your natural shape to give you the right lines for your body type. You may be worried that this won’t hide areas you don’t like, but when you also have the right proportion and fit, a flattering appearance will naturally result. The trick is to work with your body instead of against it. Tim advises cutting your body into thirds from your shoulders to your feet. The ideal is to have a ratio of one-third on top to two-thirds on bottom; for example, a tucked-in dress shirt and dress pants. Never cut yourself in half with your clothing. Having the right proportion will elongate you and de-emphasize your midsection. Remember not to wear a print that is too large, or it will overwhelm you. Last of all, make sure every piece of your outfit is proportionate not just to your body scale, but also to each other. You should look balanced from head to toe. A common mistake men make is to wear ill-fitting clothes in an effort to look thinner. This tactic actually does the opposite. When you wear something with too much volume, you look bigger as well. When you wear something that is too small, you look like you’re going to burst at the seams. Wearing clothes that fit your body properly, no matter your size, is actually the best way to appear thinner and highlight your favorite areas. 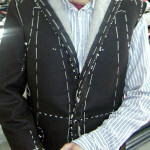 For the best fit, have your clothes tailored.